Oil shale is organic rich sedimentary rock containing algal kerogen, an organic chemical compound that, when heated, can produce oil. Also known as “the rock that burns”, oil shale is made up of a solid mixture of organic chemical compounds and is mined in the same manner as coal. Oil shale is notably different from the product shale oil, which is a substitute of conventional crude oil and is a conventional hydrocarbon in tight formations released by fracking. Oil shale was first discovered as a valuable commodity in Scotland in the late 1700’s. The source of discovery in Tobane Hills became generic name for Torbanite, a grade of oil shale. Oil shale deposits vary considerably in nature and yield around the world. In Australia the largest deposits are in Queensland, and were formed around 40 million years ago in freshwater lakes. 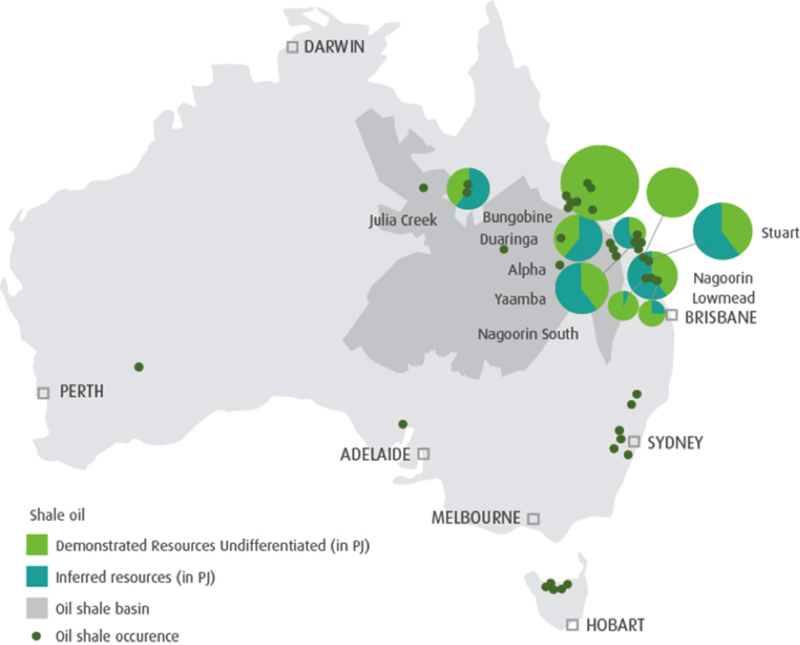 Oil reserves in Queensland oil shale deposits total more than 20 billion barrels, while global estimates of oil shale reserves are around 3 trillion barrels. Geoscience Australia (2012) identified a total Australian oil shale resource of equivalent to 22 billion barrels of oil, with Queensland seen to have over 90% of that resource. Three of the largest deposits in Queensland are Condor, Rundle and the Company’s Nagoorin deposit. The Alpha site is one of the smallest but highest grade deposits in Queensland.